With such a pedigree - having two designers fresh from completing the Lancia Stratos project, following a similar mid engined concept - the X1/9 should have made a competition winner. In production form, its inherent disadvantages of weight and budget mechanicals could easily be replaced with Fiat/Lancia’s competition alternatives. So why didn’t this happen? Fiat's interest in the marketing potential of rallying had really begun in the late sixties, supporting privateer entrants using their new twin cam engined 124 spiders and saloons. By 1969 they had assembled their own rally team around the 125 twin cam saloon and 124 Spider. In 1971 Fiat seized the chance to purchase Abarth & Co from Carlos Abarth on his retirement. And international rallying success was persued with a combined team using the newly homologated 124 Abarth. The marketing potential of the growing rally scene had done much to promote the 124 Spider, and Fiat planned to emulate this success with the X1/9. But problems emerged, firstly from disrupted markets & finances caused by the oil crisis of 1973. And secondly an identity crisis at Fiat. Their takeover of Lancia and 50% stake in Ferrari caused a confusion of strategies and models. In an effort to renew the Lancia brand, most of the next 20 years rally effort was to take place under the Lancia banner (the 131 Abarth being an exception). By 1988 this meant that Abarth was rationalised out of existence too. But in the seventies the Abarth expertise at Corsa Marche was immediately harnessed towards rallying by Fiat (Abarth were directed to cease race based new car designs and focus on rallying. 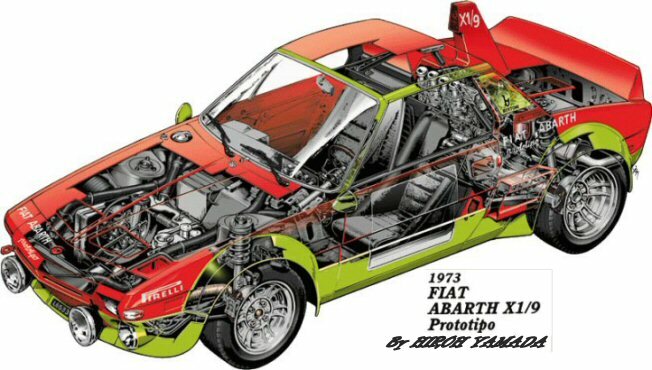 And indeed the Abarth expertise was strongly evident in Lancia post Stratos efforts too. At the time of the X1/9 Prototipo 2000 launch in 1973, Fiat were still producing the 124 Spider Abarth as their main rally car, while Lancia were competing from the same Car Group with the hugely successful Stratos. The idea for the Prototipo was credited to then Fiat Works driver Gino Macaluso. Abarth were tasked to develop a series of prototypes in association with Aurelio Lampredi supporting engine design and Giorgio Pianta car testing. When we consider how little was needed to produce an X1/9 that was both strong and competitive, it is a great shame that no room could be found for this competition car in the grand scheme of the Fiat's seventies competition programmes. As a rally weapon, its times on National rallies suggest it was quicker than both the last version of the 124 Abarth and even the 131 Abarth that followed it. There are so few cars that can 'naturally' produce this sort of pace - World Cup Rally winning pace in its day - and it verges on the criminal when such cars are lost to the motorsport world. Perhaps its pace was part of the car's problem. To try and recoup more of the outlay on the competition cars and teams, Fiat wanted to connect their rallying effort to more popular models - and the 131 was chosen. It was easier to work on, and carried more ride height and suspension travel options than the X1/9. But the 131 was also heavier and less nimble. Consequently Fiat could not afford to invest in the 131 Abarth and release another Fiat that was capable of beating it - even if the budget had been available. The desire to recoup investment in world rallying from sales, dictated that Fiat would follow their close rivals Ford and campaign with their mid range saloon, rather than with another wedge shaped sports car (like the Stratos). And so the Prototipo project was buried. And with it another glorious Fiat was lost. Pictorial evidence from visits to the Abarth workshops suggests there were four Prototipos and one road going ‘course car’ produced. There is little point in relying on registration numbers as these were regularly swapped around during the project. Apparently only the workshop notes can sort out which chassis was used with what parts at any particular point (as confirmed by Abarth employees of the time). Being a prototype development you really wouldn't expect any more. The Prototipo chassis numbers ran in sequence from 23001 to 23005 in keeping with Abarth’s usual batch build practices. The build spec of each was subtely different. In particular different cooling and venting options were tried, mainly at the front of the car or supplying air to the engine bay. There is definite evidence of at least two of these prototypes being heavily damaged. And again from discussions with employees at the time, it is suggested atleast two of the cars were re -shelled for the 1974 season. 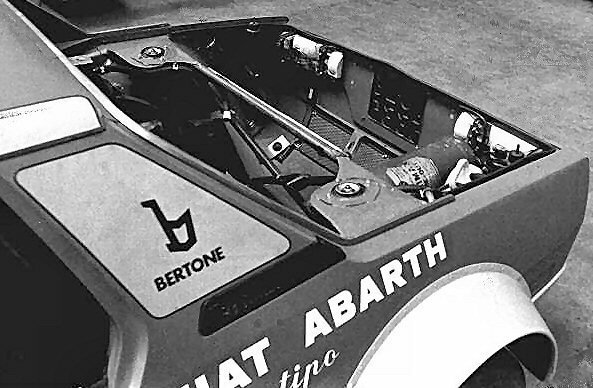 In addition the Abarth Works were also involved in the initial homologation prototypes with Bertone. Remember had the rally programe gone ahead, then a series of 400 road going 'Stradale' or street equivalents would have been needed for homologation (and sold within 2 years of the homologation date). During November 1972 Mario Colucci was responsible for a European press launch of the X1/9 on Sicily. The cars used for this launch were all registered together. Amongst these cars was an Abarth rally prototype with the registration TOH 02940. This may be the only survivor of the X1/9s from this event. Although its detailing, front spoiler and vents differ from the later competition cars TOH 02940 was essentially similar to the next series of Prototipos - in that the engine bay design, and overall concepts for weight reduction were all present. During late 1972/early 1973 three more competiton Prototipos were prepared as a batch. Various engine/box, suspension, and cooling duct designs were to be tested during the programme and so each of these three Prototipos is slightly different. These cars were registered as TOL 65335, TOL 65336 and TOL 65337. A programme of testing was designed for each of the cars, basically trying out options. The testing followed Abarth practices established with the 124 Abarth. Alongside the Prototipo testing, a project 16 valve engine and carburation options were continuing with mixed success. From 1970 Abarth had been looking at the use of its own race 16 valve heads but had encountered problems. Engine develoment on the 16 valve heads continued - basically they were proving tricky to obtain both top end power and a competitive low-to-mid range torque on the carbs used. Aurelio Lampredi himself was to lead the next stage of 16 valve engine development - effectively re designing the 16 valve head again. All this continued while the Prototipo suspension and cooling options for the wide range of World Rally Championship conditions were tried out. The eventual Abarth 16-valve head solution used in the Prototipo was similar to the Cosworth 16-v DFV head in valve position and angles. A short inlet manifold housed twin 44mm IDF downdraft Weber carbs. Although the three TOL cars all have different cooling ducts, one area of the design common to all the cars was their weight. Competition shell preparation was very similar across the three prototypes and followed the Lancia Stratos route as far as possible. So for instance all the cars lack a full roll cage, the targa roll hoop being braced with angled steel tubing. The dry weight of the car was 750kg. Returning to the question of Prototipo numbers, during Spring of 1973, another chassis and a Stradale were prepared. The Stradale was the first pre-production prototype - to test out the design and options for the run of 400 to 500 Stradales needed to homologate the competition cars into Group 4 of the International Rally Championships. Group 4 was where the Lancia Stratos was then competing. According to the regulations at the time Fiat would have had 24 months to produce these cars. Fiat had agreed that Bertone would be the manufacturer of these cars, and Bertone has suggested they planned to build more than the 400 'Stradales' needed. Now to some of the myths, I believe the white car in Martin Holmes' photographs of the Abarth Works (taken in the Autumn of that year) is not the Stradale - as its specification differs from the known Stradale features (taking Al Cosentino's description of the Stradale into account) - but I've been unable to find what purpose this car served. [Note: some of Martinl Holmes' photos were included in Phil Ward's book on the X1/9]. The photos were taken during November 1973... in particular shots of the cars in the Abarth Racing Department next to sports racer prototypes and single seaters. If they were the same car then the total number of Abarth prepared chassis is 5 if you include the first one, TOH 02940. But the white car according to descriptions at the time lacked several of the competition car features although it was prepared by Abarth.. Most notably the fuel tank front location, roll hoop bracing, and full engine bay mods. But it also retains several features the Prototipo's body work - with ducts and arches of the competition cars. Some of the sources also say this car lacked the competition suspension mods too. I would conclude the difference in accounts of the white car suggests it was later modified again. If the white car and the Stradale are not the same car then there were 6 chassis. One produced for the Sicily launch, three main prototypes, the white spare and the Stradale prototype produced in close consultation with Bertone. 23001 was the original prototype TOH 02940 produced the year before. 23003 was owned by Gino Macaluso and started as TOL 65336. Later the car was re-registered by Gino M.
23005 started as TOL 65337 and was heavily damaged in France. You will note the 'white car' is not listed and this account (from motoring historian Graham Gould and author Phil Ward) does not quite match with my conversations with ex-Abarth employees regarding the timing of the chassis preparation. I'm sticking to five as the magic number because there is photographic evidence of four cars present in the Abarth workshop in November 1973 when we know TOL 65337 was away on rally duty in France (the Martin Holmes' photos). Atleast this part of the saga fits together. The real problems begin when they were used and consumed in competition. Following damage in testing it is suggested that two of these cars were re-shelled or atleast re-built for the 1974 season. (I have difficulty translating from Italian the subtle difference between a re-shelled and re-built chassis). And this means there were more chassis parts around to confuse us now. Later one car was also re shelled after the project was cancelled another was re-built (and we think parts were shipped to Poland). But I can't find direct evidence to verify this apart from one of the employees who helped load the transporter. So Unlike the Stradale prototypes being developed by Bertone (that were ordered destroyed by Fiat), three cars survived the programme along with parts of a fourth (that may have been sent to Poland with other rally cars at the end of 1974 as part of the Polski Fiat rally programme) and the burnt & battered remains of a fifth car in France. Alex K has kept close record of what happened to the cars and I'm going to pause here to refer to his notes and website, as well as keep up a search for some black and white photos of the Abarth Works and Prototipos that may solve some of the riddles in this story. I've not yet gained permission to use some of the rare photos that will bring these words to life so please have patience! Development began with the proven twin cam 1600 used in the 124 Sport Spider rally car. Quite soon engine capacity was increased to 1840cc – although the Prototipo was badged as a ‘2000’. This was achieved by overboring the original 1600 engine to an 86mm bore and 79.2mm stroke. A special 16valve Abarth head was assembled with twin 44mm choke down draft Weber carburettors. Running in excess of 11:1 compression ratio, it gave between 190 & 210 bhp at around 7,600 rpm (depending on the cams used). A 5 speed Lancia Beta gearbox was fitted. The car also exploited the Group 4 rally regulations in terms of weight saving. The Prototipo weighed 750kg (in comparison to the last 124 Abarth’s 900kg). It was quicker than both the 124 and possibly even the later 131 Works Rally. rear: Coil over springs with lower wishbone arms. Why then the problem? Because over the two years they were being evaluated some re-shelling was done. And a little like Middle Age cathedral relics, parts of cars or cars with parts have been appearing ever since. From the best information available, we think 23001 still exists. 23002 was involved in a fire and may be lost completely 23003 is owned by Gino Macaluso of Club Italia. 23004 is in the States and 23005 has been rebuilt in Japan. But I'm going to need to consult further on this one! The white car remains enigmatic. If forced to guess I think it was used as part of a rebuild of one of the competition Prototipos. The fate of the cancelled Stradales of the planned homologation programme is a great disappointment as they were destroyed. Bertone have suggested they planned to build more than the 400 needed. The Prototipo was the intended basis for their performance version of the X1/9. But Fiat had already developed the larger twin cam version of the X1/9 from their X1/8 and X1/20 projects as replacement for the 124 Coupe (eventually the Lancia Beta Montecarlo), and awarded this brief to Pininfarina. Would a run of 400 performance X1/9s have been so commercially disastrous? There were not that may Beta Montecarlos produced link to Montecarlo figures. The white car - from my discussions with Abarth people there is another possible translation from Italian of 'muletto' - sorry if I'm spelling this word wrong - I'm refering to my notes of a discussion in the mid eighties - in which it was described as the "muletto". An alternative is that it was the first mould or pattern for all the Prototipo plastic body work parts. (It can also refer to a course car on a rally). It’s always difficult to assess vehicle history at this distance. The danger is that you end up adding to the fog rather than penetrating it. So I'd welcome some further inputs! Competition began for the Prototipo in 1973 with the national level Rally di Sicilia, followed by the Quattro Regioni. In neither case did they finish. In 1974, the Prototipo won its first Rally – the Alpi Orientali, followed by a second victory in the Coppa Trabucchi (by Bacchelli). A third victory was achieved in the Laburna Rally. It failed to finish the Giro d’Italia in 1974 with Clay Reggizoni driving. In the seventies such a reliability record was quite exceptional in a new car. Showing that Abarth had got to grips with the car's teething problems fast. Problems getting more from the 16-valve head design proved more challenging. The continuous development around this head design is more of a project on its own. The Prototipo being just one of several chassis it was developed in and for. And with the Abarth designed Volumex supercharger in a 2-litre engine its capabilities would have been formidable. Certainly a match for the all conquering Stratos. But I'm getting ahead of the history. That line of development was to be persued in 1980/81 with the beginning of Lancia 037 development - the successor to the magnificent 131 Abarth. Looking through the driver's feedback about the car in autobiographies there is little to go on about the feel and ease of competitive driving with the Prototipo. General impressions were it was cramped and too low for the rough stuff, but a handling delight in comparison with the 124 Spider Abarth. Power was lacking at first, but eventually it would have proved faster than the 131 Abarth that caused its cancellation. Fiat included a sports car with each new model range. And the range of cars most closely associated with the X1/9 was the 128. This was the first front wheel drive design put into production under the Fiat badge. Strange to think of the mid – engined X1/9 as a front engined/front wheel drive car, but part of the brilliance of its engineering is the use of a front engined layout turned through 180 degrees and mounted on the rear axle line. Another shock to the system could be the dates at which the X1/9 plot was being hatched. Ever since the BMC Mini was announced, Fiat had been experimenting with transverse engined prototypes, notably during the ‘123’ projects of 1958-60. These resulted in Fiat testing the market with the Autobianchi Primula in 1964. By 1967 the 128 projects had reached full-scale mock-up, carrying the prototype code X1/1. 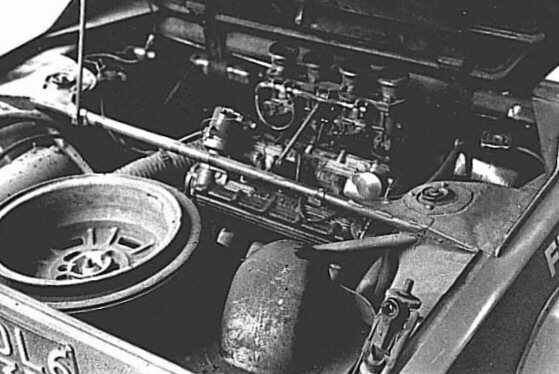 Meanwhile Lampredi had completed a single overhead cam version of the hugely successful belt driven twin cam engine. The resulting 128 1100 was launched and voted ‘Car of the Year’ in 1969. Nuccio Bertone was asked to present a replacement to his 850 Spider and offered a mid engined design based on his Lamborghini Miura. Only front and rear engined alternatives were requested – but he added a third mid engined option. To back this option up he developed the ‘Barchetta’ or Runabout in 1969. It was badged an Autobianchi. Its floor pan was basically an 850 Spider with a disguised 128 1100 front subframe, with engine and drive train turned through 180 degrees and rear mounted. The body shape, rollover bar, bulkheads and basic mechanical configuration of the X1/9 were all present. Further research in 1970 with a buggy (the Shake) refined the mechanical side. It was far from clear which 128 Spider design would be chosen. Mid engined cars are always going to be more costly to produce. And Fiat had expressly wanted a budget sports car to fit into the 128 range. Then impending safety regulations in the influential US market threatened to outlaw all soft-tops and a change of heart at the top of Fiat unleashed the mid - engined designs. By 1971 designs for the X1/9 were well underway, with several key players including chassis designer Puleo drawing on their experience with the freshly completed Lancia Stratos. The doubts remained around profitability - could the higher costs of a mid engined design be overcome? So I believe the conflicts in aspiration between Fiat and Bertone fixed both the fate and potential of the X1/9 here in 1972. Why is it called Ix-Uno-Nove (or X-1-9)? Because it carries its own secret code from the ‘X’ projects that created it. Fiat did not want such an expensive car associated with its budget 128 range, and late in launching relative to the rest of the 128 range. Bertone preferred that its name would outlast the 128 range too. A front engined 128 Spider - the replacement for the 850 spider was never produced. Why did the X1/9 never have a more powerful engine? It didn’t get the support. Coachbuilder Bertone championed this project, and Fiat only regarded the X1/9 as its budget sports car. The concept was ‘boxed in’ by Fiat – as they intended to build a larger mid engined car. Designed in parallel to the X1/9, the G.31 - X1/8 and X1/20 projects were eventually commissioned to Pininfarina, and became the Beta Montecarlo (Scorpion in the States). The intrigue surrounding these ‘X’ projects is worth a web page on its own. There is a hint of Bertone falling out of favour with some of Fiat's management here. Why do you still talk of its performance potential thirty years on? Because the X1/9 was so closely based on the Lancia Stratos chassis concept, it can take masses of torque from much more powerful engines. You could describe it as over-engineered. The Uno and Punto Turbo engines use the same engine block and don’t upset the car’s balance as much as the heavier Twin Cams. In road manners & cornering it was not until the nineties that it was surpassed. Its interesting to compare X1/9 dimensions and layout with the Lotus Elise which has a wider track and better weight distribution but is otherwise quite similar. What sort of car is the X1/9? It’s a two seater targa top – the roof can be stowed in the front boot. The transverse engine is in the middle, and the car has a both a front and rear boot. It’s a great pity that more sports and kit cars have not copied its twin boot layout! Can I Build a replica Prototipo? Yes the panels are available to take a standard X1/9 and produce the Prototipo look. Re-engineering the engine bay to take a Twin Cam in the same style as Abarth takes a lot more time and money. We'll take a closer look at the build on a dedicated page - watch for the link here! Can I get the rear boot spoiler? Yes, it is often sold as a complete rear boot lid with integral spoiler. It was called the 'Corsica' style spoiler - that's where they were first publicised on test. The intention is to create an area of dead or still air in front of the spoiler so that air flowing off the rear of the roof is encouraged to 'eddy' against this pocket of still air - rather than creating more drag against the car body itself. While we're waiting for some decent shots of Dave Robey's car, here are some other notes.. The Dallara X1/9 page is here. And a short piece on the Filipinetti X1/9 here. Belgian support for Abarth has always been considerable - especially following Fiat's takeover in 1971. This is thanks in no small part to many Belgian's taste for small fast cars (the first Abarth agency founded outside Italy was in Gent), as well as Guy Moerenhout. 30 years ago Guy opened his car workshop and successfully rallied several cars including Porches, becoming regional rally champion. Guy focussed his tuning and workshop efforts on Fiats and then Abarths. Soon Guy began encouraging people to buy and restore all sorts of Abarths. He founded the Abarth Squadra Rally. And has since organised World Abarth Meetings across Europe. Moerenhout and Co continues to flourish along the same paths. There is an Italian site www.fibercar - offering a comprehensive kit for the Prototipo and Dallara X1/9 as well as several other cars (like the 131 Abarth, 124 Abarth...). We don't have any experience of the products offered, so can't recommend or criticise them.... and there are no prices on the site that I can find. But they do list complete one peice GRP doors (with frames) for the Dallara. Also its obvious that the products are coming from different places - the lay-up matting and resin techniques differ in the images across each of the car types. More searching is needed! There's also a Scandanavian Prototipo kit around - as soon as I have details I'll post them. Guy Moerenhout, famous Abarth suppliers in Belgium also offer a kit, and build pictures can be seen here.